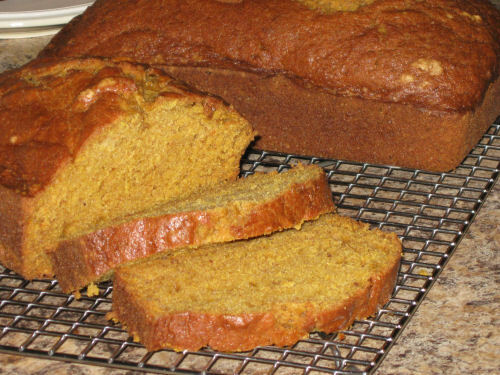 This recipes yields 2 loaves – 1 to keep (they freeze well) and 1 to give away. The aroma while these bake is intoxicating. Preheat your oven to 350 degrees and grease 2 loaf pans. Take out the 4 eggs and let them sit on counter while oven preheats – give this about 30 minutes. In a large bowl place all the dry ingredients – whisk/sift well. In a medium sized bowl, add the eggs and beat lightly. Add the pumpkin, water, and oil and whisk/mix well. Stir this into the dry ingredients to the count of 20 (1 Mississippi, 2 Mississippi, etc.) 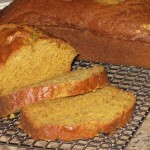 – you don’t want to over mix – this is my way of never over mixing quick breads. Even though there may be some unmixed flour, that’s okay, mixing anymore will make the loaves tough and dry. Scrape out of bowl equally into both pans; place in oven for about 60-65 minutes, until a toothpick or knife comes out with moist crumbs. Place on racks for 10 minutes, invert onto racks to cool completely.